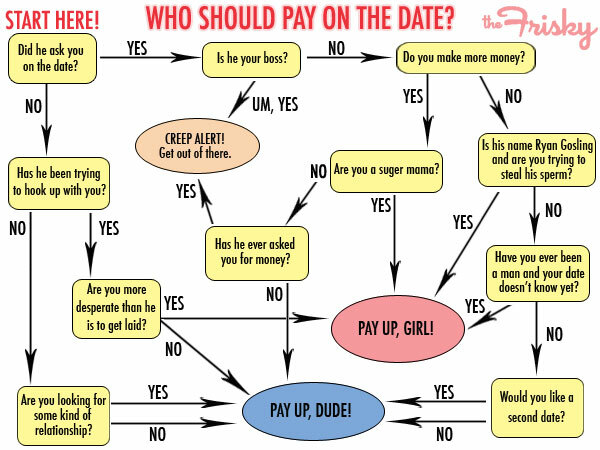 Should The Guy Pay On A Date? We’ve all heard that when heterosexual couples go out on a date, the guy should pay. Though, I’m pretty sure this began before a lot of women’s rights acts. In this day and age it’s become more of a cliché –Yet still a common practice amongst many couples. Should the rule remain in our society today? Homosexual couples don’t seem to be any more confused than heterosexuals in the dating game, but I suppose it’s a habit we’ve yet been able to break. For the longest time I’ve always said that I couldn’t care less about how much money the guy I’m dating made. It mattered much more who they were as a person, and how we felt about each other. As long as we could go out once in a while and neither of us were struggling financially in a way that effected our relationship, I always felt their income shouldn’t be of a concern to me. I always said that I didn’t care if the guy treated me to dinner or not. For the most part, I still stand by this, but I’ve noticed I might care about all of this a little more than I thought. I’ve dated the unemployed and the six-figure income guys and the happiness of our relationship or reason for it’s end never varied much. (Although, some of those relationships were when I was a lot younger and probably in part while I was still living with my parents.) But, I recently dated a guy for a few months and I knew he didn’t have an incredibly high income or much extra money floating around to play with. He paid for my dinner and drinks the first few times we went out, and then we began to split the bill. I’d been an advocate of how fair this was and thought that I had no problem with this. But, after some time, I found myself complaining that he never paid for anything for me. This wasn’t even true because he still purchased some of my drinks, or occasionally covered larger portions of the bill –But I caught myself complaining to him anyway. So what was it? Did I feel insulted? Was it that it’s somehow ingrained into me that the social norm on a date is being taken out by the guy, who covers all the costs? Was I just feeling like being cheap? And so, should we try to completely drop this rule? Is it possible to drop? Should we replace it with a new rule? I thought I was the one who wanted to do away with the rules and games of dating. It makes sense that whoever suggests the place/activity, should cover the cost of it –But will it ever be a common norm that the girl pays for the guy? Should the norm for everything be to always be split? Should the guy pay at the beginning and then everyone for themselves? Again, why should it be the guy, then? Should we base it off of who has a higher income? Yes, many studies show that men are still paid more than women on average –But of course this isn’t the case in every situation. Should we base it off of who has less bills to pay? Should a girl take it as an insult if a guy doesn’t want to pay for her? I guess it’s the type of thing that will continue to be a judgment call and unique to each relationship. If I can state I believe one thing, know it makes sense in my head, but still be bothered by not being treated once in a while, how is anyone else supposed to know how to go about it anyway?! I suppose I’ll continue my trend of watching the waitress place the check on the table, reaching for my wallet, asking how much I owe as the guy turns it over, hope for the “I got it” reply, ask “are you sure?”, if confirmed, thank them, and if not pay my portion, while secretly being a little bit disappointed. It’s become such a routine, I’ve sometimes found myself actually asking my date, “Did you want me to do the fake wallet-grab to be polite or should I just ask if you just going to pay for it?” I think it’s coded into my genetic make-up at this point to initially assume the odds of the guy paying for me are pretty high. This entry was posted in Dating, Dating Guys, Other Words and tagged date, dates, dating, guy pay first date, Heterosexuality, norms, relationship, relationships, should a guy pay, social norm by TiredOfDating. Bookmark the permalink. Maybe I don’t question this because I’m in my 40s, but I think it’s the guy’s responsibility to pay on a date. If he doesn’t, that tells me he’s either (a) so cheap and/or chronically broke he’d be unbearable to live with long term or (b) doesn’t really like me enough to care about impressing me, which means he’s not worth my time. I think that makes sense if you want someone who can financially support you in a serious relationship, but I’m just not sure it always applies to everyone anymore, in every situation. A friend today spoke of it just showing chivalry, but the idea of the man always taking care of the woman and so on is becoming an outdated idea, I think. It’s true some people are impressed by money/financial success, but I’m not sure it’s something that holds true for every person and the guy paying seems to still be the social norm we’ve accepted for all. Each is entitled to their own opinion on it, but I guess it bothers me that society has decided on one way for all…when we’re all different. I think it changes as we get older. As a student, if I was dating a fellow student, I would go Dutch because we were both probably poor. If I was dating a guy who had a real job, I would “let” him pay for me most of the time but would treat when I could. These days I feel like if the guy asked me out, he should pay. After the first few dates, and depending on our relative situations, he could pay or I could pay and that would be fine. At the very least, I would make him dinner. I agree with it changing as people get older and how it’s a good idea at the beginning, but I’m still just wondering why it still is always put upon the guy today and if it will stay that way since I think our society is changing and although not 100% there yet as on average men are still making more than women, we’re becoming more equal. Well, I think it’s also a matter of who asked who out. If a guy asks me out for dinner, it’s like he’s extending an invitation and therefore it would be for him to pay. If a girl asks the guy out then it would be appropriate for her to pay. I always offer to pay. I’m financially able to, so why shouldn’t I? Sometimes the guy insists that he pays, sometimes we split it, sometimes I pay for everything. I don’t think it should have anything to do with traditional gender-roles. I think that if you can afford to pay, then you should at least offer (whether you’re a man or woman).